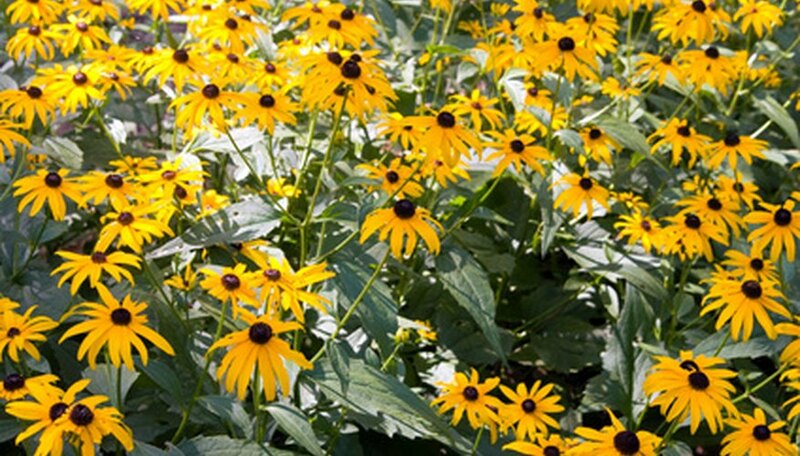 You say "rudbeckia", but others may simply call them "black-eyed Susan." Rudbeckia is a genus of nearly 20 species of perennial or annual wildflowers native to the meadows of North America. Regardless of species, their flowers comprise a central cone or disc floret surrounded by red, yellow, gold or orange petals. Many make excellent cut flowers and bloom over a long period from summer into early autumn. Hardiness varies by species, but generally they grow in USDA Hardiness Zones 3 though 9. Rudbeckia grows best in your perennial border or meadow where it will receive at least four to six hours of direct sunlight each day. They also can tolerate all-day sun. Inadequate light levels diminish the number of flowers produced. Rudbeckia species tend to grow their finest in any somewhat fertile soil that is heavy but well-drained. A loam or clay enriched with some organic matter promotes lush plant growth as well as prevents hot sunshine from wilting plants. A soil that remains evenly moist is perfect. Avoid excessively acidic or alkaline soil types. Newly planted Rudbeckia needs watering daily for the first two weeks to help establish its root system. Once growing, monitor rainfall or irrigation amounts so that the soil remains moist but not soggy. Plants survive on about 1 inch of water weekly, perhaps a bit more in sandy soils or during excessive summer heat or drought. Rudbeckia stands up well to seasonal dry periods in summer and fall, enough to still display a nice flowering. Rudbeckia does not need liquid feeding or even granular fertilizer applications. The garden, open woodland or meadow soils need not be tremendously fertile, just enough to support weeds and grasses. In fact, overly rich top soils may cause some species to reseed and spread to become slightly invasive. Once frost kills the foliage, Rudbeckia can be cut back to the ground, but leaving the foliage adds texture to the garden and protects the perennial roots from winter cold and freezes. Annual species will naturally decay over the winter. After four or five years, perennial clumps can be dug up in early spring as new growth just starts or in autumn after flowering for division and replanting. Humid weather may lead to powdery mildew on leaves. Removing excess stems to increase air circulation among plants is beneficial. Deer may munch on rudbeckia's tender new growth, but once the fuzzy, coarse leaves toughen up, the deer don't usually bother.